Rail people are passionate about preserving the heritage of classic rolling stock and whilst Solo Rail Solutions core business is maintaining stock in active service, it was good to give a helping hand to a charity focused on Class 43s. Chris Clifford Solo’s Commercial Manager was contacted by 125 Group to see if Solo could make some covers for a car they were putting into service. 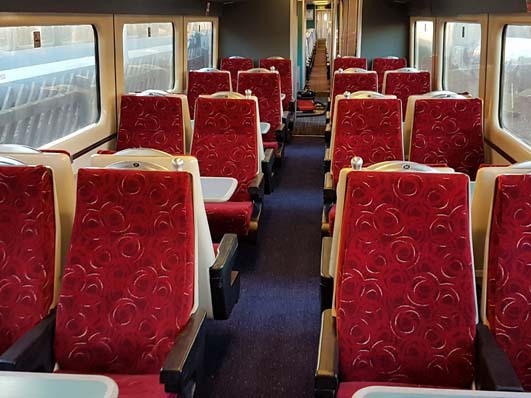 125 Group free issued the fabric and Solo turned it into seat back and base covers for an HST trailer car and they were delighted with the result. Chris Clifford said: It’s nice to get positive feedback from a client that appreciates the skill and dedication that goes into the finished product. Solo’s new seating division offers clients a complete refurbishment solution from creating the metal structure to the upholstery and embroidery. 125 Group was established in 1994 by a small but dedicated band of HSTs enthusiasts who share the enjoyment of the Class 43s. Their role is preserving for future generations examples of the magnificent trains which the revolutionized the long-distance rail network in the 1970s.